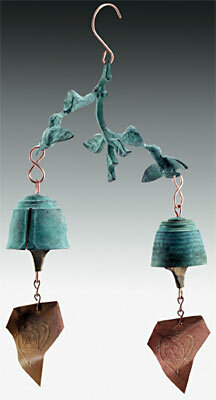 Two bronze hummingbirds share a pair of blossoms in this unique bell sculpture. Featured are a 731 (high pitch) bell and an SA7 (low pitch) bell, two of our most popular small bells. Please see our Wedding Chimes page as well. This Harmony Hollow double bell is symbolic of your marriage. The two bells have different vibrations representing your distinct personalities. Each bell has its own unique tonal qualities that blend together with the other to create harmony. The bells are joined together by a single design that symbolizes the union of two independent people into a harmonious couple. The bells are guaranteed to ring in clear and pure vibrations for you for the next 350 years, amplifying and reflecting your commitment to each other. Congratulations. May the vibrations from these bells reflect your own happiness and love. 2 3/4 lbs. - Length 19"